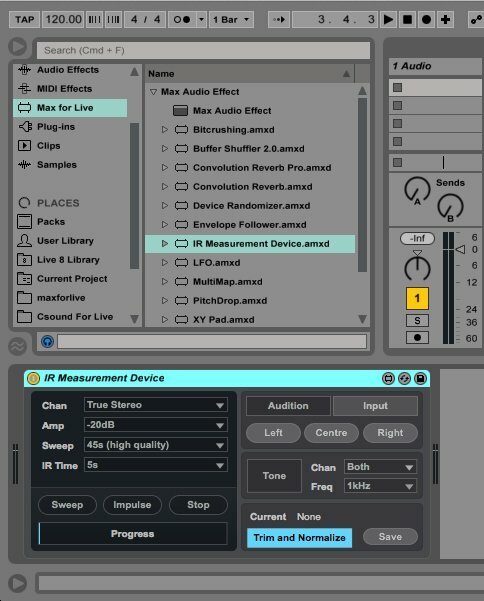 Ableton Live 9 Suite introduces a number of new premium Max for Live instruments and effects, including Convolution Reverb and the advanced Convolution Reverb Pro. Using samples of sounds - known as impulse responses, or IRs - the Convolution Reverb can give the input sound the character of the IRs. While the Convolution Reverb comes with a thorough library of diverse IRs - from classic plates and springs to gorgeous natural spaces to experimental sounds - it also includes the IR Measurement Device, for easily capturing your own IRs. In a new tutorial, macProVideo's Gary Hiebner demonstrates how to use IR Measurement Device to build up a library of your own custom IRs, and give your music a unique sound.